Nice to meet you, Mark!! Your link address didn't work on the blogfest so I looked at it an fount it was entered as http://crossplanes.blogspot.como. May not get too many people coming from that link. I love the family comment! We may yet homeschool. Its such a leap of faith though. 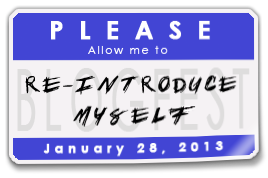 And thanks for participating in the Re-Introduce Myself Blogfest! Great to meet you via the blogfest! Family first... can't go wrong with that philosophy! You sound like the king of gaming!